Miniature roses are a great and often misunderstood subset of rose growers. Miniature roses offer you versatility that you can’t usually find in other types of roses. First off, you should understand what a miniature rose truly is. 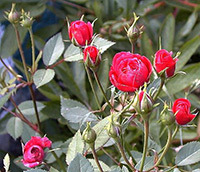 Some growers believe any variety of rose that produces small diameter blooms is classified as a miniature rose. This is not always the case. While miniature roses usually do produce blooms on the smaller side, this is not the only characteristic of these wonderful roses. You will find most growers will only consider a rose a miniature if it grows less than 24 inches tall. There is even another category of miniatures called micro-miniature roses. These will grow only about 6 or 8 inches tall. Growing miniature roses is truly its own hobby and you just might find that you like the ease of dealing with these smaller roses, much more than their larger cousins. Even though they might not grow to the same heights as other varieties, you will find that the growing conditions for miniatures are not terribly different from other roses. The most important decision you make is what type of soil to grow them in. Roses need soil that drains well, but so quickly that it starves the plant of vital nutrients. If you are growing your roses in containers, this is very easy to accomplish as you can just go out and buy a potting soil mix designed for roses. 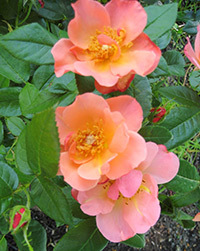 Some folks prefer to mix their own soil when growing miniature roses and that’s ok too. If you are going to plant your miniature roses in a flower bed in your garden and aren’t sure about the quality of your soil, add a little organic compost to your garden soil at a ratio of 1 part compost for every 2 parts soil. This is a great general mix for most plants and roses absolutely love it. You should also plant your miniature roses in a location that gets full sun. A good rule of thumb is to give them at least 6 to 8 hours each day or direct sun light. Some varieties will do just fine in partial shade but they will rarely produce as many blooms as they do with full sun. Planting your miniature roses is pretty simple but it does depend a little on how you purchased them. If you bought them locally at a nursery, then they were most likely already planted in containers and probably ready to bloom. This is the most common. All you have to do is plant them in a container, or dig a hole that is at least twice the diameter of the root system, and equally as deep. This gives you plenty of room for your new soil mix and it keeps the bud union at its current depth. If you are growing miniature roses from a bareroot plant, then the planting instructions are just a little different. You should first soak the plants overnight in a bucket of room temperature water prior to planting day. Then dig a hole that is as wide as the longest roots, and deep enough to allow you to set the plant atop a mound of soil while still keeping the bud union an inch or two below the surface. Spread the roots out in all directions and back fill the hole halfway to start. Water the loose soil heavily until it flows like mud, then fill the hole the rest of the way. Give it one more heavy watering, being sure to top off any final settling that may occur. Taking care of your miniature roses is a pretty simple matter. You need to make sure that you are providing them with ample water. In a flower bed a good rule of thumb is to give them one deep watering per week unless you live in a hot or dry climate. This is even more important if you are growing miniature roses in containers as they will dry out much more quickly. Be sure to play close attention to the moisture level of your roses. 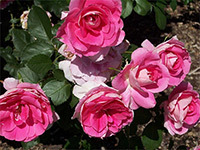 You should also give your roses a dose of an all-purpose granular fertilizer in the early spring when the leaves begin to form. Most varieties of miniature roses are vigorous growers that bloom repeatedly, and they will benefit greatly from additional feedings throughout the growing season. I will usually give my roses a second feeding right after the first big bloom, and then a third feeding sometime around the middle of summer. Your miniatures will do very well on this schedule as well. You should always prune your miniature roses in the early spring before the leaves form. This makes it very simple to see what you are doing. Start by removing all the dead wood, as well as any canes that look discolored. Next, cut back any lateral canes that overlap one another as these will compete for sun light once the leaves fully open. Lastly, cut back the remaining canes about one third of their current height and prune for shape. This is also a great time to clean up around the base of your roses and get rid of all the dead leaves and debris that may have collected there from the previous growing season. 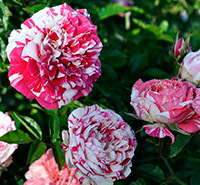 When growing miniature roses, never let decaying matter lay around as this could lead to various pests and diseases. Always throw away this material in the trash, along with your cuttings. I always finish up my pruning by giving my roses a fresh layer of mulch to start off the growing season.